Every kitchen comes with branded, fully-extending ‘anti-slam’ soft-close drawer technology as well as soft-close hinge technology for the doors. Often companies will give you a price for a kitchen and then hit you with hidden extras – annoying! With Retail Kitchens, you will not have to purchase things like hinges, soft-close technology, drawer runners & boxes or cabinet legs – they’re all included in your price. All of our carcasses are made from 18mm thick MFC (including the backs of base units) with an extra thick 2mm PVC edging for added protection. They are fully colour-coded to your choice of kitchen door. This means your carcasses will be of the highest quality and stand the test of time. So whether you need help planning your fitted kitchen or just fancy having a go at installing the kitchen yourself, you can rest assured that we will be with you 100% of the way. Easy to adjust and practically invisible once fitted. These branded brackets which are both high tech and high quality come as standard with every wall unit. All cabinets are delivered fully assembled with push fit legs holders attached so now you can get cheap kitchens with high quality fixtures. Doors are hinge-hole drilled in most cases and drawer runners themselves come pre-installed and assembled. 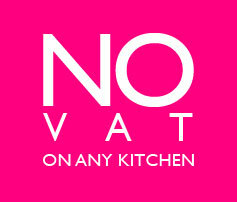 As a national kitchen company we supply kitchens, appliances, accessories and worktops to the whole of the mainland UK. All fitted kitchens are delivered using our own delivery vans and drivers to avoid damages and missing items. Any additional parts required after delivery would be couriered using trusted services. We supply and install a full range of Granite and Quartz Our sister company both supplies and installs high quality Premium Grade Granite Worktops. 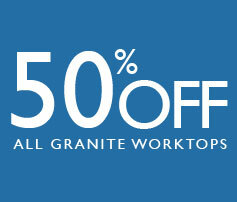 Simply click Granite Worktops for details.